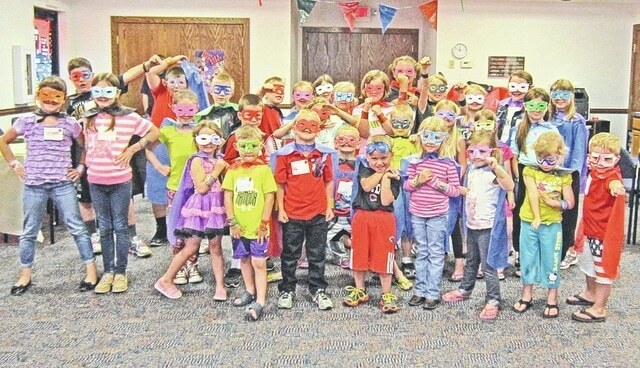 Local children are shown participating in the Greenfield Library’s Summer Reading Adventure. Summer Reading Adventure is here. Summer reading is for all ages – 1-111. Vacation time is a great time for some down time with a book. We have lots of good new books so stop in, grab a book, and enjoy summer. Summer Reading Adventure is a fun time at the library. At signup children will receive a bookbag, bookmark, a reading log, and a tattoo. They will then receive prizes along the way and many coupons at summer’s end. Teens and adults also sign up and each time they check out and read a book, they will put in a drawing for an end of the summer prize drawing. Everyone looks forward to summer reading and this summer will be great. You can sign up anytime during June and July. We want to thank all the sponsors of this year’s Summer Reading: New Sabina Industries, McDonalds, Frischs, Kroger, Star Cinema, The Willow, Dominos, Jett’s Professional Embroidery, Kings Island, Burger King, Greenfield Chiropractic, COSI, Long’s Retreat, The Beach Waterpark, Save-A-Lot, Walgreens, Robbin’s Village Florist, Advance Auto Parts, Wendy’s, Petland, Kathy Decker, Subway, Newport Aquarium, Bob Evans, Buck’s Tire Service, Pizza Hut, Dakota’s, The Glitz, Big City Pizza, Community Market, Gold Star Chili, Renaissance Park, Tecumseh, Chillicothe Paints Baseball, 3 Spoons Diner, & Roller Haven. Library Camp – June 10, 17, 24 and July 1, 8 – 10:30 a.m. to noon. For ages 5 to grade 4. Stories, crafts, fun and refreshments. Must preregister. Camp themes will include: Super Heroes, Firemen, Soldiers, Animal Heroes, & You can be a Hero. Summer Preschool Storytime – Tuesday – 11 a.m. Activities include stories, crafts and lots of fun. Please preregister. The Greenfield Public Library is located at 1125 Jefferson St., Greenfield. Hours: Monday through Thursday, 10 a.m. to 7 p.m.; Friday, 10 a.m. to 5 p.m.; and Saturday 10 a.m. to 3 p.m. Phone 937-981-3772, fax 937-981-5177 or find us on the web – www.highlandco.org. Margaret Magee is a librarian at the Greenfield Public Library.